If your home is not wired to provide sufficient power to your appliances and devices along one or more circuits, you may be able to add circuits without undertaking a more expensive expansion of your electric service. This project may require a permit, an inspection and coordination with your electric utility. It is not for individuals with no experience in electrical work. Do not mess with this stuff if you are inexperienced. A home service panel can kill. Inspect your service panel to see which circuits control which outlets and switches. Measure the peak loads on each circuit in turn (turn on everything connected to that circuit) and compare the load with the circuit's full capacity. Decide whether to divide out any of the existing circuits to new circuits to better balance your electrical power needs. Plan any additional new circuits you desire. Draft a master plan on paper so that you will not find yourself in a mess once work is underway. Inspect your service panel again to see if there are enough spare slots to accommodate your new circuits. If so, you can simply add circuit breakers (and circuits) to those slots. If not, you will have to replace your entire panel. In that case, take the opportunity to consider having two or more subsidiary service panels connected to a main service panel, greatly facilitating future electrical expansion projects. Confer with your electric utility to determine your electric service--150 to 400 amps is typical. It is critical that any upgrades you undertake not exceed this capacity. If the upgrades require more, then your project will be considerably more complex, because new capacity will have to be built "upstream" of the service panel as well as at the panel itself. Inform your electric utility that you will be performing an upgrade of the main service panel, and direct them to turn off your service temporarily. Use a multimeter to test the mains power wires for voltage. These are the two large black mains power wires coming into the top of the panel. There is also a large white neutral wire. Test one black wire with the white wire, and then the other black wire with the white one. Proceed only if the voltage readings are zero. Purchase as many new circuit breakers as you need, and install them into the spare slots on your service panel, following the installation instructions. Connect the new circuit breaker(s) to the corresponding circuit(s). The hot, neutral, and ground wires of the circuit must be securely connected to the breaker. Contact the utility to have your power restored. Have an electrician inspect your work if your state or municipality requires this, or if you want a second opinion on your work. Confer with your local authorities to see which permits are required for service panel upgrades. Acquire the necessary permits. Disconnect the service panel from the mains. Disconnect your existing circuits must from the old panel. Discard the panel. Upgrade your capacity upstream the service panel, if necessary. For safety, contract this step to an electrician. At the very least, seek professional advice prior to carrying it out yourself. Install the new, higher-capacity service panel. Wire your existing circuit breakers into the new panel. Wire any new circuits in at this time as well. Connect the new panel to the main service wires. Have your work inspected by a master electrician, who will then sign off and contact the electric utility to have your service restored. 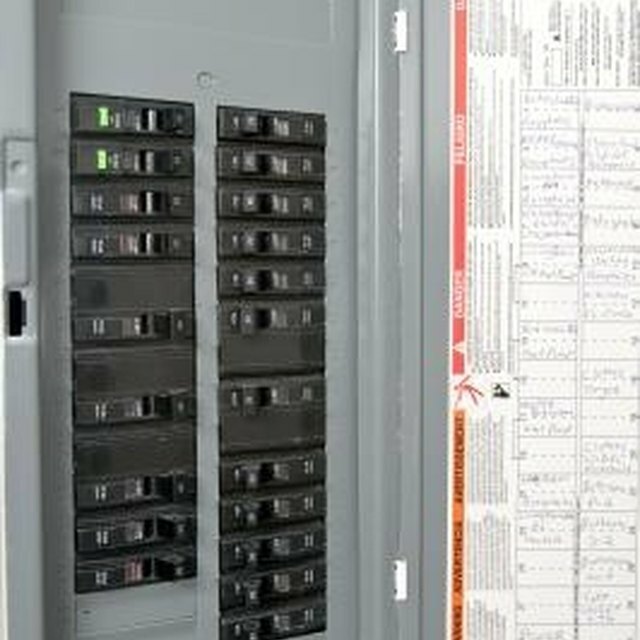 What people typically call the "circuit breaker" is actually the "main electric service panel." This panel carries all the electricity into your house and divides it among the available circuits. Each circuit is controlled by an individual circuit breaker. The service panel itself also usually has a "main" circuit breaker. Be prepared with adequate portable lighting. It is technically possible to perform limited upgrades on the main service panel without turning off the juice higher up the line, but extremely dangerous if you are not knowledgeable, since there would be hundreds of amps of live current at the top of the panel while you carry out your work.